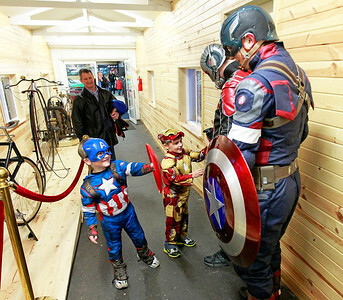 Candace H. Johnson Dan Felice, of Crystal Lake watches his twin boys Michael and Matthew, both 4, say hello to Ant-Man and Captain America during the Night at the Museum at the Volo Auto Museum. The event was hosted by Costumers with a Cause and the proceeds went to the St. Jude’s Children's Research Hospital. 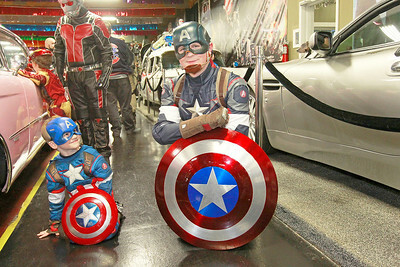 Candace H. Johnson Michael Felice, 4, of Crystal Lake looks at Captain America before having their picture taken during the Night at the Museum at the Volo Auto Museum. The event was hosted by Costumers with a Cause and the proceeds went to the St. Jude’s Childrens Research Hospital. 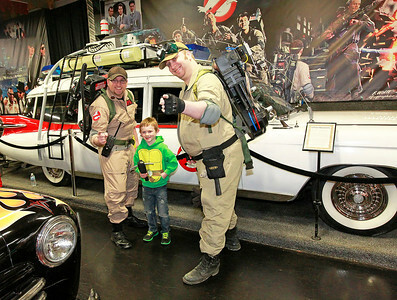 Candace H. Johnson Dominic Selvaggio, 4, of Lake in the Hills, has his picture taken with Campbell and Trayling next to the Ghostbusters exhibit during the Night at the Museum at the Volo Auto Museum. The event was hosted by Costumers with a Cause and the proceeds went to the St. Jude’s Childrens Research Hospital. 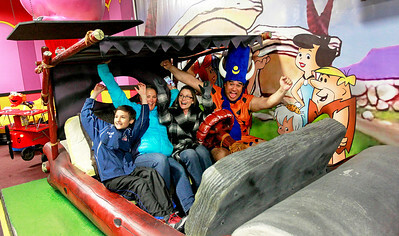 Candace H. Johnson Patrick Crowley, 12, of Lombard, his mother, Jennifer, and Heather Smith, of Chicago have some fun with Fred Flintstone in a 1994 Flintmobile in the Flintstones exhibit during the Night at the Museum at the Volo Auto Museum. The event was hosted by Costumers with a Cause and the proceeds went to St. Jude’s Childrens Hospital. Patrick Crowley, 12, of Lombard, his mother, Jennifer, and Heather Smith, of Chicago have some fun with Fred Flintstone in a 1994 Flintmobile in the Flintstones exhibit during the Night at the Museum at the Volo Auto Museum. The event was hosted by Costumers with a Cause and the proceeds went to St. Jude’s Childrens Hospital.